Great forum. I am from Luxembourg and stumbled over this string wanting to find out more about the SIC RS. I predominantly do. race (long and short), touring and DW. Question I have with the RS is will I be to heavy and tall for the 14x23 and should I better opt for a 24.5? I am 6,1 and 185 lbs. My worry is that with my weight the board will lay in the water like a cargo ship, like a Tri or a Cat that you overload and that will lose all of its performance advantages. Maybe at my weight a 24.5 will be faster? What is your view? At 84kg, you have a weight-to-volume ratio of 3.2 for the 14x23 RS. Which means that you should be absolutely fine on this board, assuming you can balance on a 23" wide board in the conditions you paddle. Thanks Areal10, the weight to volume is a good way to look at it. I tried to find a bit more info on the topic for SUPs but only found stuff for surf boards. "n reality, the thing that volume really tells us, is how "buoyant" the surfboard will be, and therefore how well the board will float you in the water. This matters because the higher a board floats you out of the water, the less drag your body will make when you paddle, and so the faster you'll be able to move." According to their calculation (the RS 23 has 271 Liter) I would have a ratio of 0,68 LBS / L.
Does anybody know to put the number in perspective with regard to (race) SUPs? My post had nothing to do with surfboards. Instead, the point of my calculation (which is much better done in kilos by the way, since 1 litre of air will float one kilo) was to point out that, very roughly, two-thirds of the board will be above the waterline when you are standing on it. So there is little chance that the board will be too far sunk to work properly. This is especially the case with the RS design, which has a full volume nose and tail and nice rocker. It's all about the waterline. But if you doubt the calculations, listen to TJR. He's a very experienced paddler and racer, and he's your weight. If you are still worried, then go demo the board - which is something you would be well advised to do anyway. You are lucky that you aren't a heavy guy. So many raceboards will suit you. Very few (if any) will suggest that someone of your weight is too heavy for it - since you are a fairly average weight, most board designs will be built to cope with your weight. Check out the paddler weight recommendations for some other brands' boards and you'll see what I mean. For instance, the Naish Maliko 14x24 is only 244L, yet Naish say about it: "Ideal for riders up to 190 lbs/86 kg". A 86 kilo person on a 244L board has a weight to volume ratio of around 2.8. This is lower than your ratio on the RS. My rule of thumb for most raceboard designs is that if you keep the ratio nicely above 3, you are unlikely to feel that the board has too little volume for you. There are some exceptions. For instance, I'm about your weight but felt that the 253L 2017 Jimmy Lewis Sidewinder was a little too low volume for me (the tail tended to drag) whereas the 274L 14x25 version was perfect for me. Instead of worrying about volumes, I actually think you should be asking yourself whether you have the balance skills to be comfortable on a 23" wide board. You can't be consistently comfortable over long distances on a board that you aren't comfortable on. You are taller than TJR, so bear that in mind. Taller paddlers are usually more comfortable on slightly wider boards. Only a demo can answer this question for you beyond all doubt. But if you have tried other 23" wide raceboards and were fine on them, then you should be fine on the RS since it is a stable design. On the other hand, if you've never paddled a 23" wide board before, then I'd strongly recommend that you go and try one before purchase. Thanks Areal10, highly appreciated. I will of course demo before a purchase but still like to get as much input as I can before that. We bought an iSUP (12.6x26) in March and I have fallen in love with the sport since. We were in Brittany (France) for 6 weeks in summer, where I intensively tested the Allstar 24.5 in Atlantic swell. I felt I could go smaller and still be comfortable balancing it (spending my energy on the stroke and not just on the balance). Apart from the SIC RS (which I like the most) I have looked at Naish and NSP. All great boards. In any event I will wait for the 2019 version to come out. I don't understand why they wouldn't offer the 14' Bayonet and 14' RS with FAST steering in 2019. They made it an option for the V2 and I think the F or FX. Surely they should provide the most modern steering system on the most modern board design in their range. It seems insane to onlky offer it on a board design that is 5+ years old. A rudder on an RS would be pointless. When downwinding an RS you need to be towards the back of the board when on a wave. So you'd be nowhere near the rudder to operate it. If you placed the rudder arm far back enough to operate it on a bump then you'd be standing on the damn thing the 95% of the time you aren't using the rudder. IMO rudders are largely pointless on 14ft boards. You only have to see how close the stock class winners are now to the UL class in eg. the M2O to see this. There are substantial disadvantages to rudders that, for most people, outweigh the (perhaps) advantages on a 14fter. This is why the ruddered 14 Bullet didn't sell well: which is probably the main reason why you haven't got ruddered RS and Bayonet models. Another reason is that many races forbid rudders on stock class boards. Who is going to want the extra weight, cost, ownership and maintenance hassles of a rudder when they'd have to take it off to race it anyway? I would say that it is for the 99% of people who don't care about racing. What's interesting is that the world's biggest stock class downwind race happened this weekend and there is absolutely no discussion about it here on Seabreeze. Downwind and racing seems to have less and less crossover. As I say, it wouldn't work for the RS design, at least, and would add expense and hassle, and I don't believe they'd be a market for it. maybe for the Bayonet. But a board needs to be designed from the ground up if it's gokng to have a rudder, because ruddered boards need to have a rocker line and nose that allows you to take the drop with your foot on the rudder arm without pearling. Maybe the Bayonet, with its slightly lowered rocker and fairly narrow nose, is just not that kind of design. Every time you touch a rudder you create drag. If you want to go really fast downwind then you should use it only when necessary. It's usually possible with a good 14ft design and the right fin setup to steer a 14ft board on bumps without needing a rudder, and speed on a 14 is so much about reducing drag that a rudder might just slow a board down, especially since a rudder mech adds quite a bit of weight. As I say, the results of 14ft boards in recent international DW races show how effective a good 14ft fixed fin can be (vs an UL ruddered) especially in fairly mild conditions. UL boards specifically designed for a rudder are IMO a completely different beast and are ridden in a different way. They are piloted rather than surfed. Did you read Jim Terrell's article? IMHO for SUP there should be a limit or it becomes a different sport (like Jim pointed out). Curious to see the new boards still (and if they picked up some of the stuff for the RS Arial10 mentioned in an earlier post). Unless you've been living under a rock for the past 5-6 years, you should know about Jim Terrell's wise words. But since no-one is willing to say "stop!" and we have no overall governing body, SUP racing is going to develop just as Jim predicts. I used to worry about that. But now I embrace it. Racing is a total irrelevance to 99%+ of SUPers anyway. Most worldwide don't even know that racing exists, never mind the names of the top athletes or races. Racing is it's own little weird bubble, and it's getting weirder all the time. If racing becomes (even more of) a niche thing that is highly regulated, the brands may turn to developing more innovative and better value options to please the other 99% of us. But we aren't there yet. There will be lots of people who can paddle a 21.5" wide board. Hell, even I can - albeit very slowly and with great effort. My balance is atrocious, so I'm sure if so can do I, most young teenagers would be able to with no problem at all after about 30 mins of practice. I think that it will only really start to bite when widths are down to 18". At that point you are going to need better than average balance skills and quite a bit of practice or you will be miserable on the board. So the wobbly old geezers can probably delude themselves for 2 more years I think, before they have to either quit (serious) racing or change the regulations. Great discussion. I now am thinking a lot about volume in raceboards as well as width. My 14' 404 27" wide Go-Go is only 247 liters. Down breezes well, surfs well, good in open ocean, sloow in flat water. My age and injuries and monster boat wakes where I used to paddle are no longer the determining factor. I just looked at the Starboard Allstar 14x22.5 (2019) weight recommendation. With 271 L it is up to 75 kg. Wonder where that puts the SIC RS 14x21.5 (or the 23 with 279 Lallready)? The 23.5 Allstar is for up to 85 kg (about my weight) at :327 L! My fear for being to heavy for the RS 23. You really can't tell anything much useful from these volumes, and I'd take the weight recommendations with a large pinch of salt. They are often more about marketing than physics. To illustrate my point, the JL 2017 Sidewinder 14x25 was surprisingly fast for me at 274L, and I'm about your weight. The 253L 23" wide version however was too low volume for me. But the 14x24 Naish Maliko was fine for me - actually pretty fast - despite being only 244L, which is 9L LESS than the narrow Sidewinder that ploughed and dragged with me on it. So, as I say, there's not too much you can conclude from published volumes alone. You need to actually paddle the board if you are in doubt. Sure, but there is time still so no rush because the 2019 boards are not out yet. That leaves me time for a deep dive. Boards are expensive and I don't want to go wrong because I get one shot only. 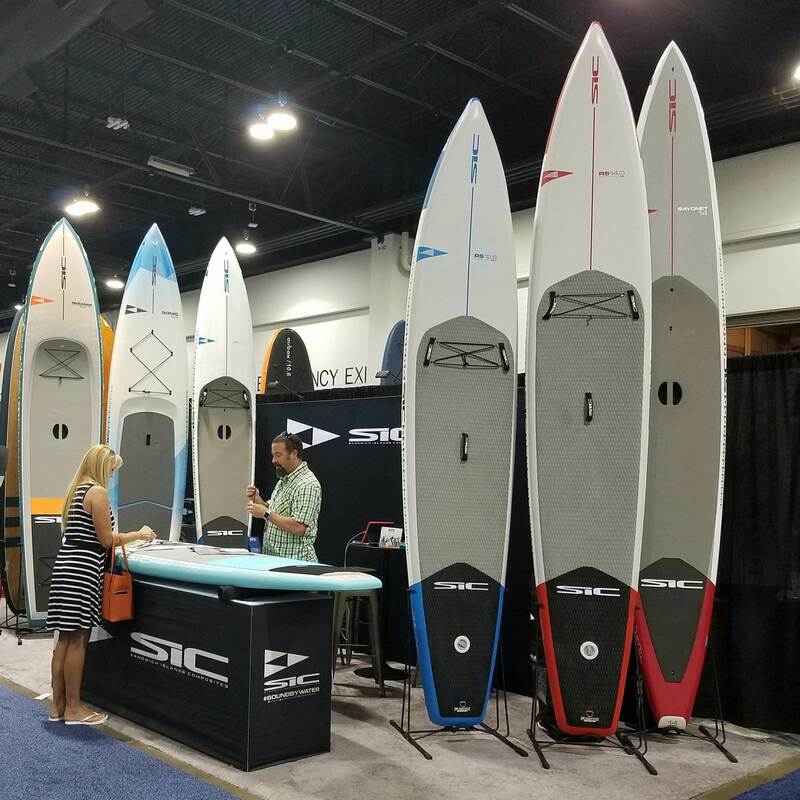 Boards on my list are SIC RS, Starboard Allstar, Naish and NSP. There is a chance to test and buy them (all) at the D?sseldorf boat show in Germany in January 2019. Until then I can do my homework and get further up to speed. I see. Well you are in for an education then. If you come from a sailing background you will be used to the information that the manufacturer gives you being accurate and relating to measurable real-world variables. But it's not like that with SUP. You can't really take either the measurements of volume, or the weight limits too seriously. They are kinda loose suggestions, usually created with marketing in mind rather than by a team of scientists who have tested everything rigorously and understand what they are doing. It's the Wild West, really. So stop fretting until you can demo for yourself. In the meantime establish some speed baselines for yourself over set courses using GPS so that when you do get to demo you'll know what is fast and what is not - because impressions of speed are notoriously unreliable: you need real measurement to determine it. Oh, and btw, now is the time to buy a 2018 board at reduced price rather than get stung for full RRP for the 2019 model. Thanks Areal10, the boating industry is no better than the SUP industry. Weights are guesses with marketing in mind. Another owner actually weight his trimaran upon delivery and it was 4.3 tons instead of 3.5. Big difference. For the moment I am soaking up as much information as I can (and I actually enjoy doing that :-). Thanks for your input already. May be you should consider the Fanatic Strike 21,5 too. Very stable and fast board in the flat. A 21.5" wide flat water board being described "very stable". Ok, so I'd love to know what raceboard you think is "tippy"...?